Grace McGinty (Carlsbad ’15) and Jensen Coop (Corona del Mar ’17) were named the Mountain Pacific Sports Federation (MPSF) Player of the Week and Rookie of the Week, respectively. The full story from GoAztecs.com is presented below. In the midst of arguably its most productive season ever, the San Diego State lacrosse program collected two more Mountain Pacific Sports Federation awards Monday, as Grace McGinty was named Offensive Player of the Week, while Jensen Coop garnered Rookie of the Week accolades. 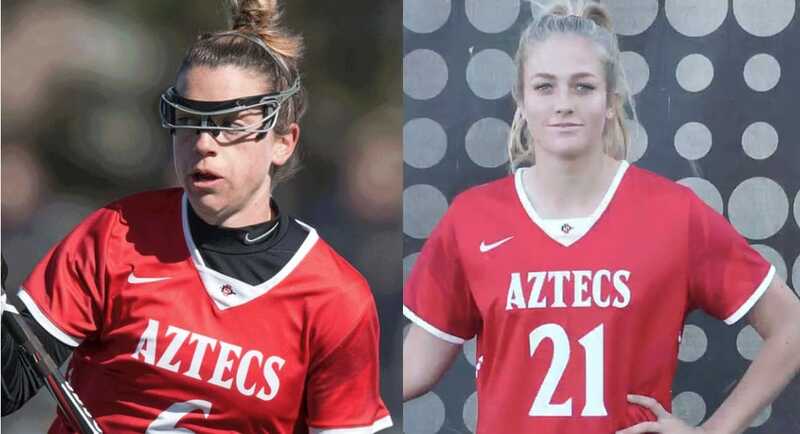 The two honors are career firsts for the Aztec teammates, giving the Scarlet and Black 11 conference weekly certificates already this season. A native of Carlsbad, Calif., McGinty combined for a team-leading eight goals and 10 draw controls in a pair of road victories over Furman and Wofford. In addition, the SDSU junior finished the week with a .917 shot-on-goal percentage (11-12), highlighted by a 6-for-7 clip on free position attempts. Against Furman, McGinty led all players with a career-high five goals, converting 4 of 5 shots from the free position. She also recorded a personal-best five draw controls, powering the Aztecs to an 18-7 triumph over the Paladins on March 16. Two days later at Wofford, McGinty was one of three SDSU players to net a hat trick in SDSU’s 23-4 conquest, which marked the program’s single-game high for goals scored. Additionally, the Aztec midfielder matched her career high with another five draw controls vs. the Terriers on March 18. For the season, McGinty occupies the second spot on the squad with 20 goals, which ranks fourth in the MPSF. She has also connected on a team-high 12 free position shots for an average of 1.20 per game, good for second in the league and 21st nationally. The Carlsbad High alumna has also compiled 24 draw controls, five ground balls and one assist on the year and has logged five games with multiple goals. Meanwhile, Coop displayed her versatility last week, totaling three points on two goals and one assist to go with four draw controls and one ground ball. She tallied her first collegiate helper on SDSU’s final marker against Furman while winning one draw. Against Wofford, the Newport Beach product scored her first two goals in a Scarlet and Black uniform and came through with a season-high three draw controls while gathering one ground ball. San Diego State (7-3), which has matched its best 10-game start in program history, returns to the friendly environs of Montezuma Mesa this week when it plays host to Liberty University on Friday, March 23, at 7 p.m. PT. Admission to all Aztec lacrosse home games is free.